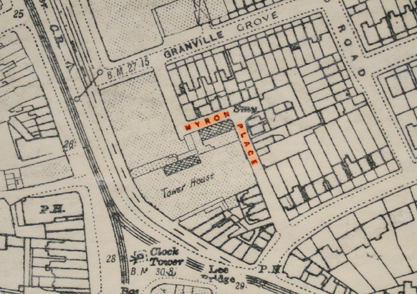 Thomas and Christiana's son George was born 6th of March 1904 at 3 Ivy Terrace Myron Place Lee (Lewisham). Charles Booth the founder of the Salvation Army produced a poverty map of London in 1899. The report (shown left) shows his comments on Myron Place which appears to be a relatively poor area. 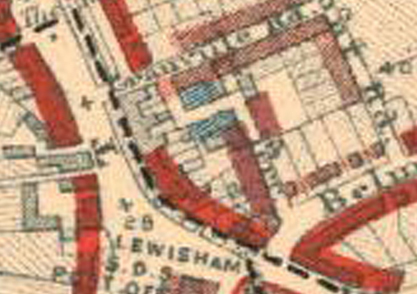 The maps below both date from this time and show the colour coded Booth Poverty Map (left) and a large scale map which shows the individual houses in Myron Place. Although Myron Place exists today by name, the area has completely redeveloped with no trace remaining of the orignal houses.